Originally, this tool was created in 2006 as an Excel macro for researchers. 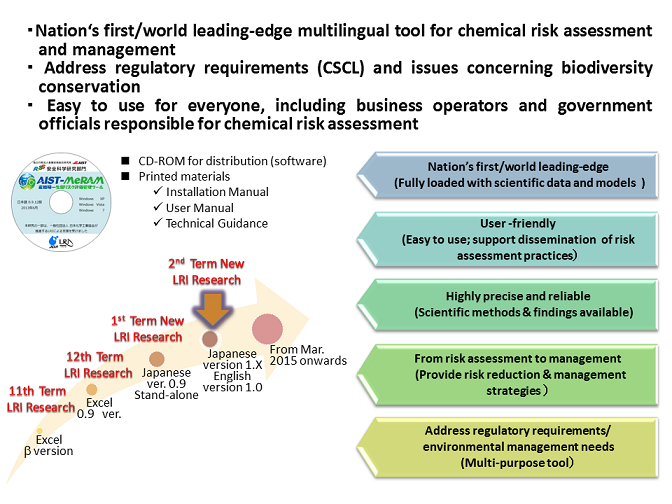 However, since 2010, we had actively incorporated needs of business operators to develop a “truly valuable and user-friendly tool for industry” under the JCIA (Japan Chemical Industry Association)-promoted program called LRI (Long-range Research Initiative). Furthermore, since October, 2012, we had pursued development of a stand-alone application that would operate on personal computers, and eventually first released its 0.9.12 Japanese version in July 2013, and then Japanese version 1.0.1 and English version 1.0.0 in December 2014. As of April 2017, Japanese version 2.0.1 and English version 2.0.0 have been released. Released AIST-MeRAM (in Japanese) Ver. 0.9.12.